Nike tells retail locations to beware of bogus coupons featuring Colin Kaepernick's image following controversial ad campaign's release. Colin Kaepernick’s image appears on bogus Nike coupons that have circulated online in recent days, offering huge discounts “for people of color” in the wake of the apparel giant making the controversial quarterback the face of its new ad campaign. The barcode included in one of the coupons, which can be found on 4chan, an online bulletin board where most users post anonymously, came up as “invalid” when USA TODAY Sports took it to a Nike store in the Washington, D.C., area. Nike sent alerts to each of its retail locations in the U.S. to warn employees of the dubious coupons. Nike unveiled the Kaepernick ads last week as part of a promotion to commemorate the 30th anniversary of the "Just Do It" slogan. The company has been criticized in some circles and animosity has inflamed toward Kaepernick, the former San Francisco 49ers quarterback who was the first to knee during the national anthem two years ago to protest police brutality and social injustice. 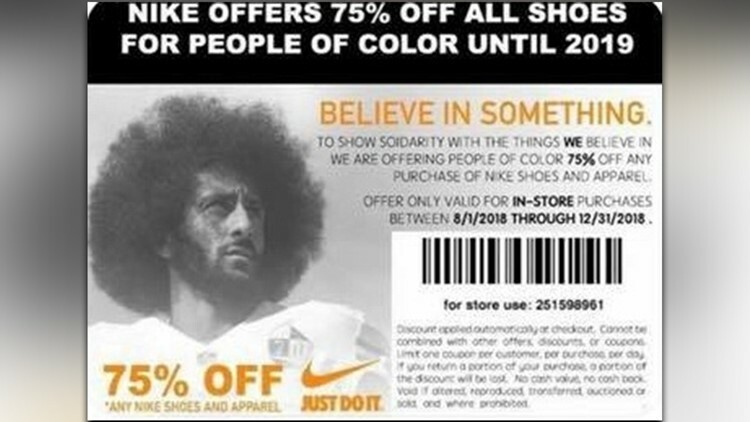 One of the coupons calls for consumers "To show solidarity with the things WE believe in we are offering people of color 75% off any purchase of Nike's shoes or apparel." Bogus Nike coupons featuring Colin Kaepernick have circulated online over the last several days. Nike’s point-of-sale systems, however, aren’t equipped to read QR codes, so that message would not have appeared if an associate had attempted to run it. Employees at two stores told USA TODAY Sports that none had seen a customer attempt to use any of the fake coupons. The employees asked that their names not be used because they were not authorized to speak publicly about the issue.